Yesterday’s portrait showed my brother Mike’s* rage at himself. His self harm would usually involve hitting his head, biting his hand and slamming his arm into his chest. I mentioned yesterday that, when I was growing up in the 1950s and 60s, I was not frightened of him. Maybe I should have been. Mom told me once that she saw Mike near me or my younger brother with a hammer. My parents told my younger brother and me that they tried to shield us as much as possible from Mike. I didn’t feel shielded, nor did I feel the need for shielding. I always thought of Mike as a deeply complex puzzle. I would almost have welcomed a bit of physical contact from him. *Mike is my older brother, who is autistic, low functioning and nonverbal. He currently resides in a geriatric group home. 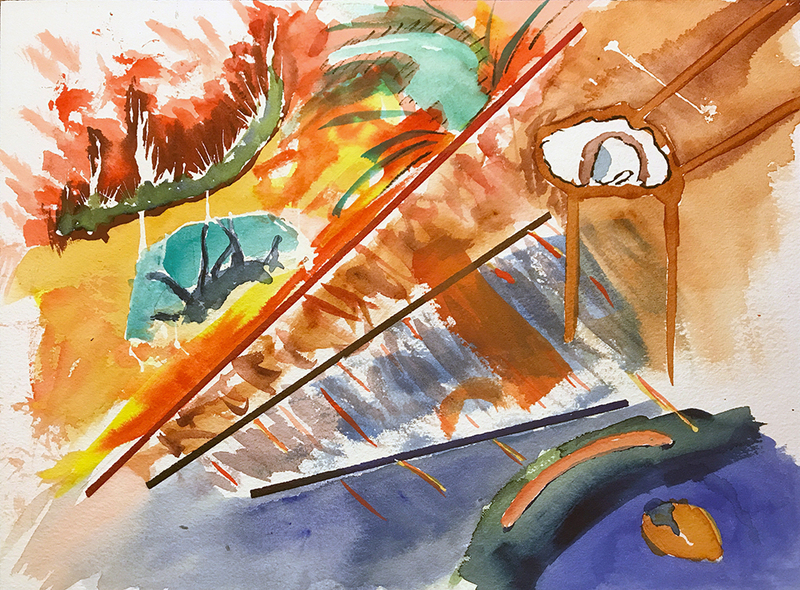 This entry was posted in Personal Stories and tagged abstract art, artistic process, autism, autism parents, autism siblings, creative process, painting, portraiture, visual arts, watercolor. Bookmark the permalink.